Zenith Fuel Systems, founded in 1911 has been synonymous with quality, technology and leadership. Zenith celebrates 100 years of manufacturing carburetors in U.S.A.
Save money on your next purchase of replacement ECU for your ZEEMS - Electronic Fuel Injection System - Click here for details. have developed a new carburetor for John Deere 3010 & 3020 or 4010 & 4020 Tractors. Click here for details. Zenith Fuel Systems LLC is launching a new product in the market to assist part's manufacturers when performing operations, such as: CNC machining woodworking, welding, metal cutting, deburring, etc. This product was initially designed to help Zenith in the machining and assembling processes of its own parts. The new ZENITH VERSATILE QUICK CLAMP can hold almost everything you want. The simplicity and flexibility of this product will reduce fixture/tooling investment and operator loading/unloading time, at a very affordable cost. 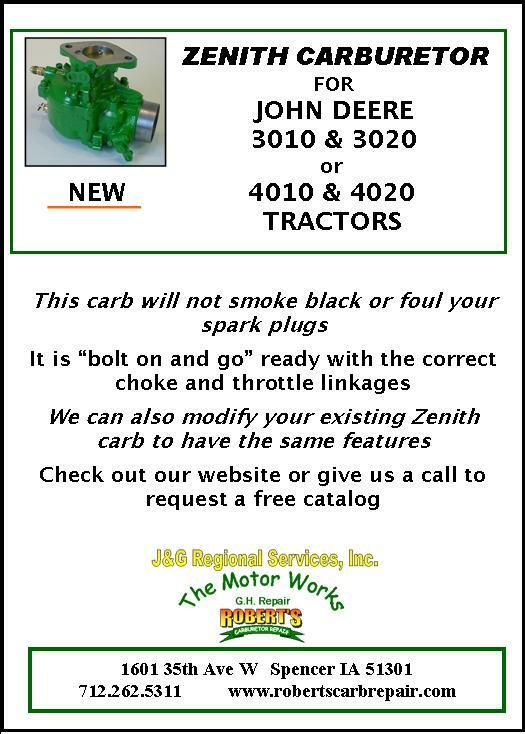 Zenith has been asked if service parts for John Deere DLTX carburetors are available. These carburetors were originally manufactured by Marvel Schebler and are no longer available. Some of these carburetors were a single barrel carburetor and others were a duplex style. Zenith can still supply many replacement parts to service many of these carburetors. Copyright © 2000-2013 Zenith Fuel Systems LLC. All rights reserved.